The market made an new all time high overnight but it was already correcting by the time the cash market opened. I usually take into account what happens in pre-market, so this wave from 1990 to the equivalent of 2006 in the cash market could be considered the 5th wave or wave 1 of 5th. There's also the chance of an expanded flat scenario where the market will test the 1990 low again, but I am assuming the W4 is done. 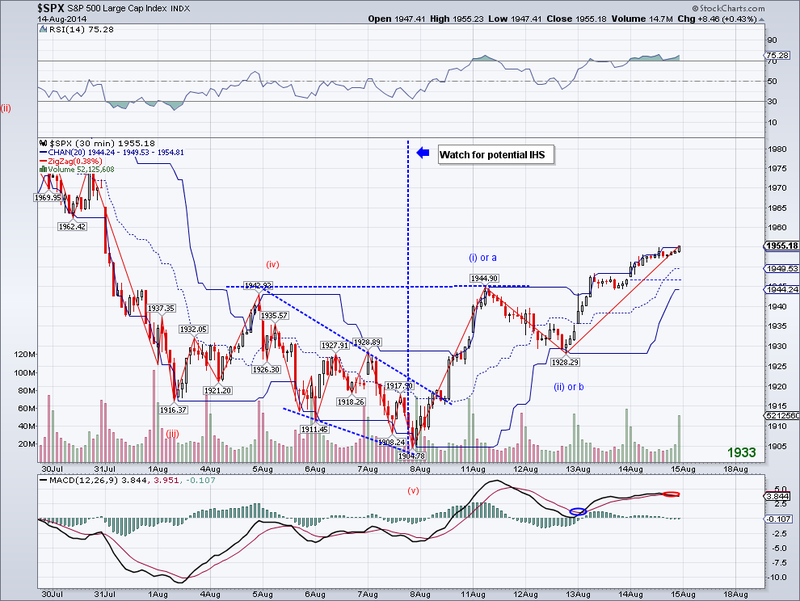 If w1 of 5th was from 1900-2006, then I have 2030 as the target before we see a substantial correction. The situation in Russia is not getting better, and it could be the catalyst for a strong correction so many have been waiting for once all the waves are in. But for now, the market is ignoring geo-political events and focusing on higher highs. The pulback has continued today and the market made a slightly lower low. And like yesterday, the correction could now be over since short term oscillators have been reset and the market has chosen to ignore Russia. If Russia had sent troops to Ukraine a few weeks ago when the market was under the 50 DMA, I am sure the market could have really sold off. But for now, the market doesn't think Russia going into actual war is going to impact the equity markets much. The market wants to make new highs and apparently there isn't much that is going to stop it for the time being. 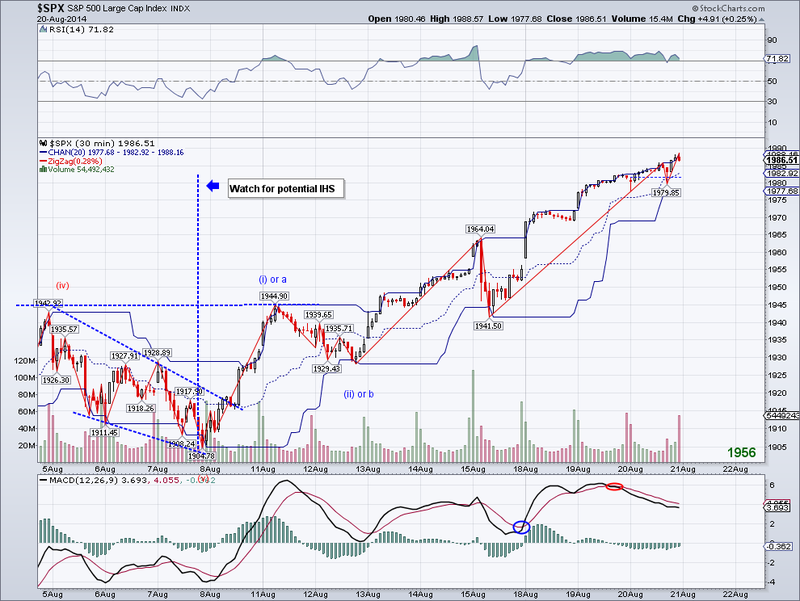 The market corrected as I was expecting and so far it looks like it will be a small W4 correction. Perhaps it will go into some form of zig zag to the level I mentioned yesterday, but I can also see the low for today as the entire correction since that low coincides with support. So we'll see how the market reacts to the news of Russia actually sending personnel into Ukraine to fight. If the market ignores it, chances are new highs will come as soon as this week. I closed my shorts for a small profit to avoid the risk of a gap up, but I will buy them back when I see the structure completed. Today we got yet another all time high, but unlike the other 29 highs this year, this one is historical since it is the first time the SP500 has closed over 2000. The first time the DJI crossed 2000 was in 1987, so whoever thinks the SP500 is way too high, look at the 17,106 close on the DJI today. You simply can't fight real GDP growth + Inflation in the long term, this is why people who buy and hold do well over long periods of time. With that said, we are trying to time the market here so we can make an extra few bucks, so I ended up shorting at my 2004 target as I now see the W3 completed. I am looking for a mild correction to the 1979-85 area or the Trend Average, but if the market decides to sell off, I am ok with that too but I highly doubt it. 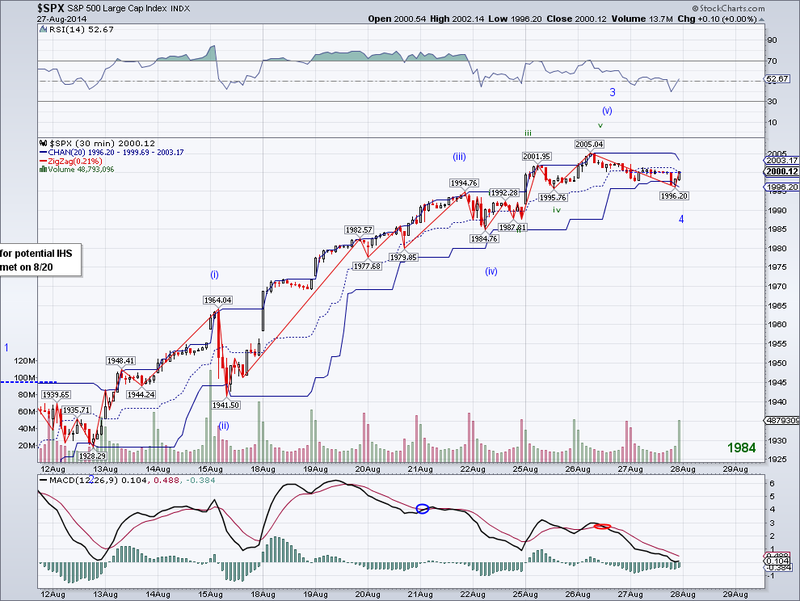 My suspicion on Friday was correct and today we got the 5th wave to complete the 3rd wave from the 1904 bottom. Looking at the micro count, it still looks like there is another minor push up, so the 2004 level I mentioned on Friday might get hit before a correction to the 1979-1984 area. Now that the index is exactly 3X 666 (March 2009 low), it makes me wonder how many people using Elliott Wave in 2009 were able to enjoy this 200% return. To be clear, I completely missed the run up initially because I was stuck with the old theory. But what I learned in the past few years is invaluable and will hopefully help me achieve my retirement goal in the not too distant future.. 2017 is just around the corner, which is my target retirement year. We got a small correction today as I was expecting and we could see the market continue the rally next week in a 5th wave to complete the structure. I was hoping maybe we would see 1979 tested, but 1984 is close enough and it is in the 0.5-1% correction range I mentioned yesterday so I sold my shorts to avoid a surprise on Monday. 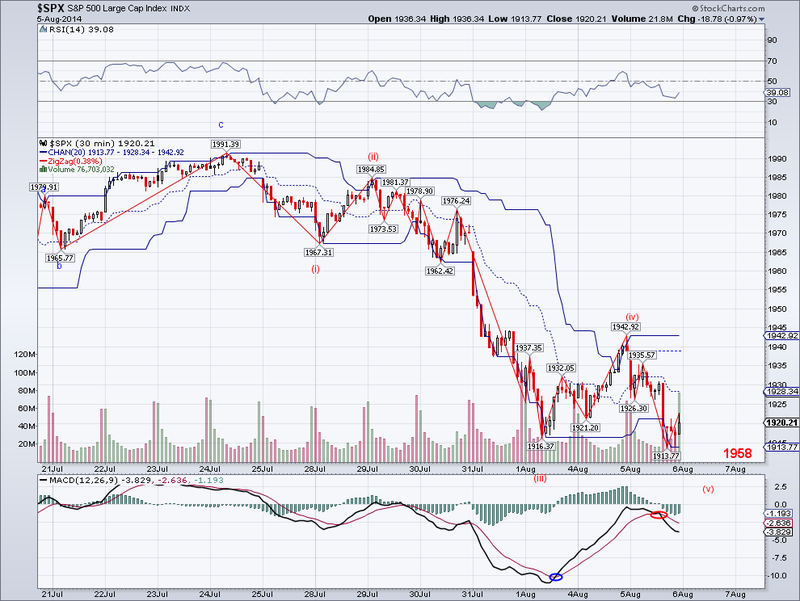 We could still see more downside on Monday but it's safer not to risk it unless there are clearly 5 waves in. 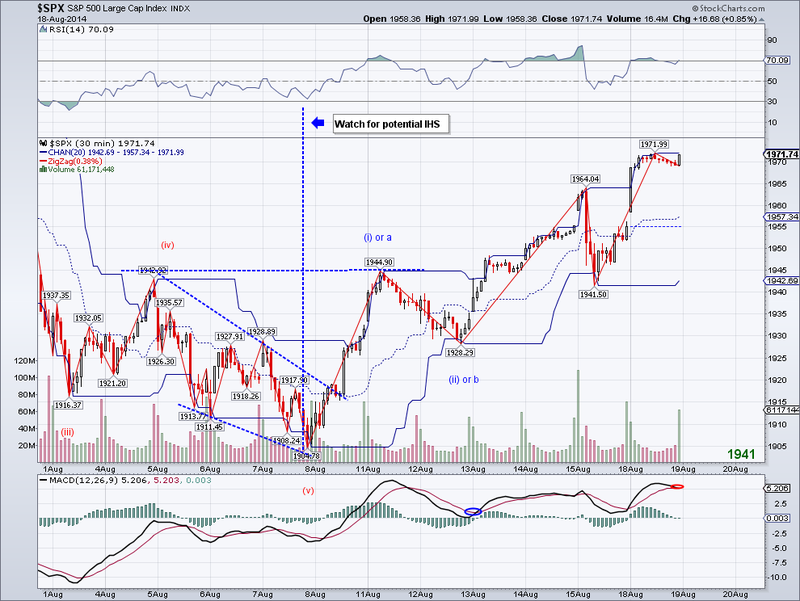 If the wave from 1984 to 1992 is a micro W1, then I am expecting a top around 2005. Maybe it will extend to 2014 and then sell off to 666! not.. The market put in an all time high as I had been expecting and now we should see a pause for a W4 before another bullish wave that will rally past 2000. I am assuming the market will find the 1.618 ratio significant, but if there is not drop tomorrow then this W3 will start extending. And as I've said in the past, as long as the economic background (good earnings growth to be specific) continues to support a rally, this multi-year rally will go on and on. The fact the Fed might raise rates translates into a healthy economy, so the removal of QE is actually bullish and not bearish as some people think. With that said, I went short at 1993 in hopes of a .5-1% correction (A test of the TA would probably asking for too much). If this turns out to be an ABC from 1904, which I doubt at this point, then great. If not, I'll just make some money for my coffee fund. The market came a few points of its all time high, despite the 30 min MACD correcting (which is highly unusual and a sign of bullishness). A little help from China's PMI overnight could easily propel the market to a new high tomorrow. Looking at the waves, if I add 1.618xW1 to the 1929 low, we get 1993. 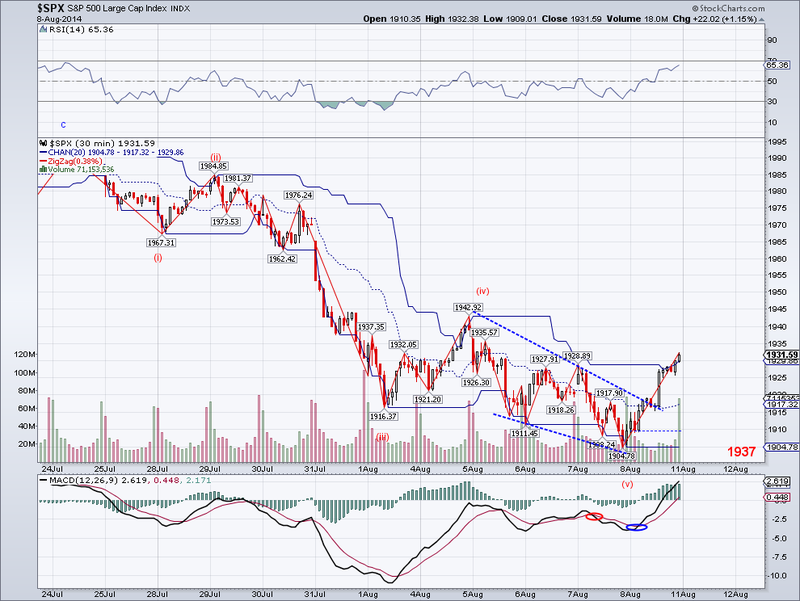 However, since this looks like a nested 1-2 structure, the rally can go on for a while before exhausting. Also, the Intermediate Trend has turned back bullish which basically supports the completion of a 5 wave count from the 1904 low. The market has continued its rally and the Inverse Head and Shoulder target has basically been reached with today's high. The market could still be putting in a "flat" correction, but looking at the NASDAQ, it looks like this rally might go on for a while. The fundamental picture continues to favor higher prices and as long as there are no signs of an economic slowdown, prices will continue to go up. Perhaps the market will go parabolic in the next few months before finally putting a decent correction? Maybe when the doomers finally go bullish, the market will tank! The market made another high for the structure today and it is now looking like a bullish nested 1-2 that should easily rally past SP2000. The NASDAQ made a 14 year highs today and it might lead other indexes from here. So unless something disastrous happens in the next few days, bulls are going to make another run for the next few weeks until the next top. I've lost count of how many 1 wave corrections we've seen in the last couple of years but it seems we've seen them as often if not more than the traditional Zig Zags. Whatever the case, just keep an eye on the TA and we should be ok.
Also, I should add we issued a very well timed short for the recent correction and we recommended covering shorts the day before the rally started on http://www.ewaveanalytics.com Obviously, we're not always going to pick exact tops or bottoms but I think our analysis has a good combined value. The market gapped up this morning but then lost all its gains before bouncing at end the day neutral. I realized I made an error in calculating the length of the C wave. Adding length of A to 1928 gives 1968 not 1978, so the high today would satisfy a C wave and allow for a sell off on Monday. At the same time, I could argue for the nested 1-2 that will top over 2000 once the entire structure is complete. Given the bullish cross on the daily MACD, the bullish TA and the IHS pattern. It looks like bulls are back in charge. Too bad, I missed my chance to go long.. but at least, I am enjoying my long term portfolio. The Trend Average has turned green with today's close and we might see a nested 1-2 develop in the next few days. The 50 DMA served as resistance and there wasn't enough conviction to get the market past it. But if the prices are able to successfully test the TA, we should see 1978 at a minimum if we get a C or much higher if it's a W3. Also, the daily MACD will probably make a bullish cross tomorrow or Monday (unless something unexpectedly bad happens), so the short term is favoring the bulls. I tried bougth Oil today but got stopped out at a loss, that to me points to stability in the Iraqi situation. 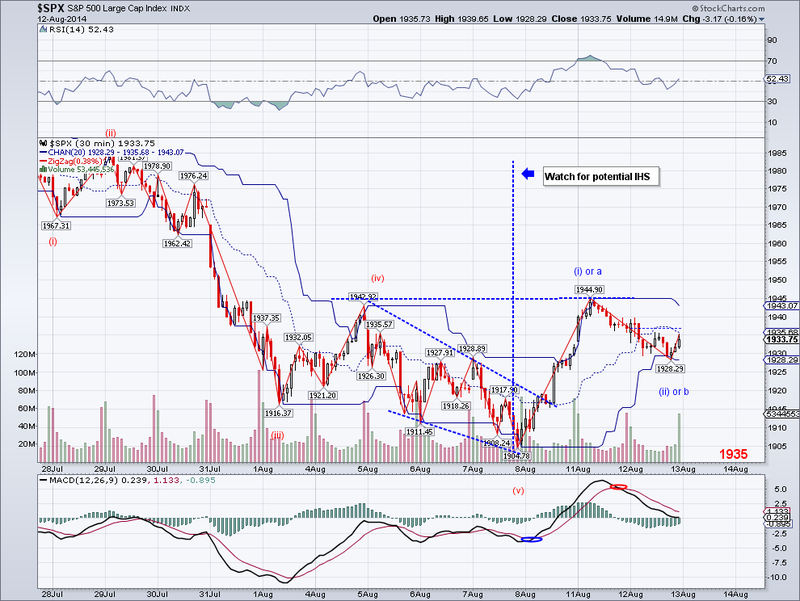 If the TA is successfully tested, I will buy the SP500. 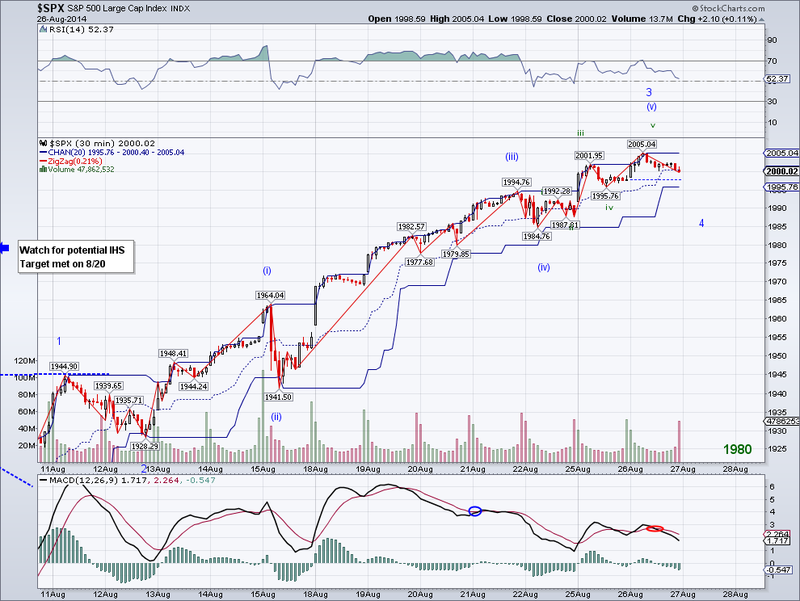 Seems like the market has bottomed for the B or W2 wave and now we will see if the current wave is a C or a Bullish W3. 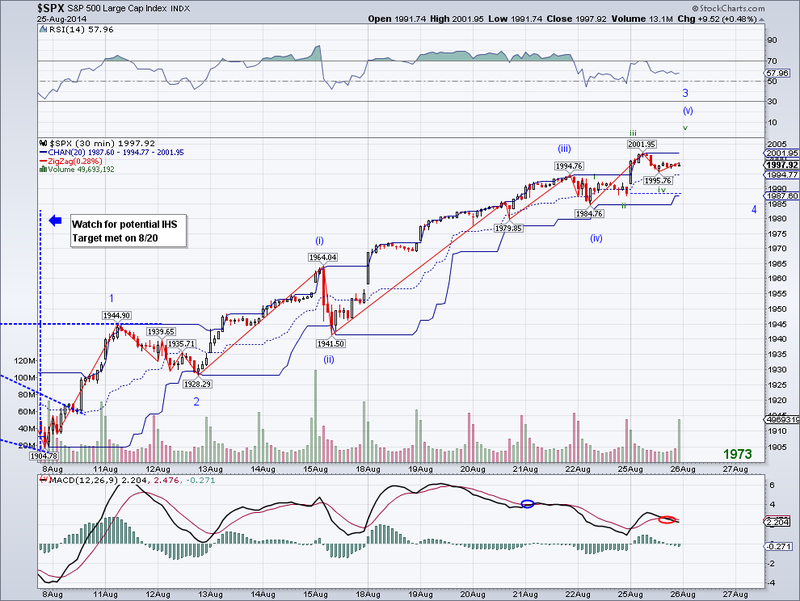 An ideal ABC would top at 1968 and then reverse hard or go into another zig zag. But if this wave can get very bullish and get the resistance in the 1973-78 area, we will most likely see the all time highs being challenged. The daily MACD seems to have bottomed and is looking for a bullish cross, this after resetting itself for almost a month from an overbought position. 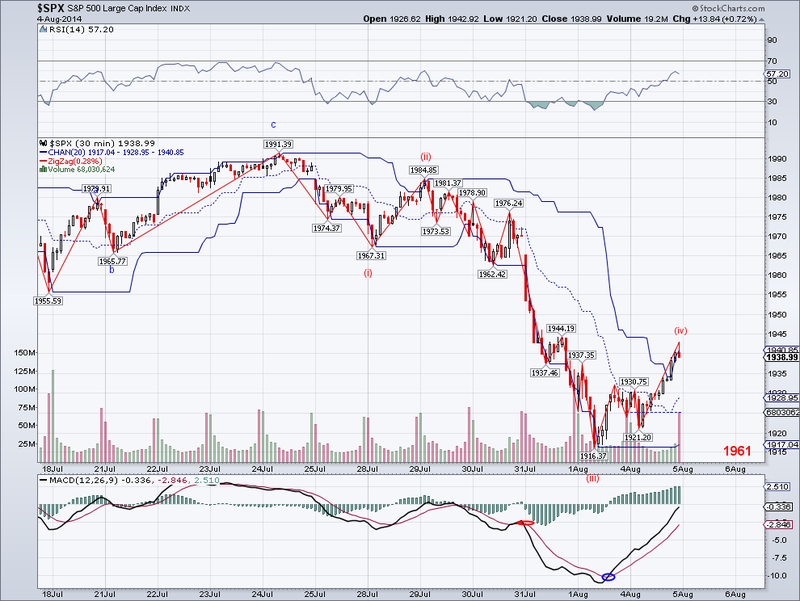 So despite the bearish trend in the market, this counter rally has the potential to turn into a strong bullish wave. Things will start favoring the bulls if the market can turn the Trend Average bullish and close convincingly over the 50 DMA, currently at 1956. I sold Gold today for some profit and looking for the next set up to get back in. Too bad the SP decided to go into my target buy area in after hours last Thursday.. I'd up almost 3% by now. A lower low was made today and technically it is enough for a B or W2 as the wave found bottom at the 38% retracement level, so we could see a bullish wave appear as soon as tomorrow. I still prefer to see the 1916 level tested first but not sure there are enough bears to bring the market down without a good geo-political excuse. 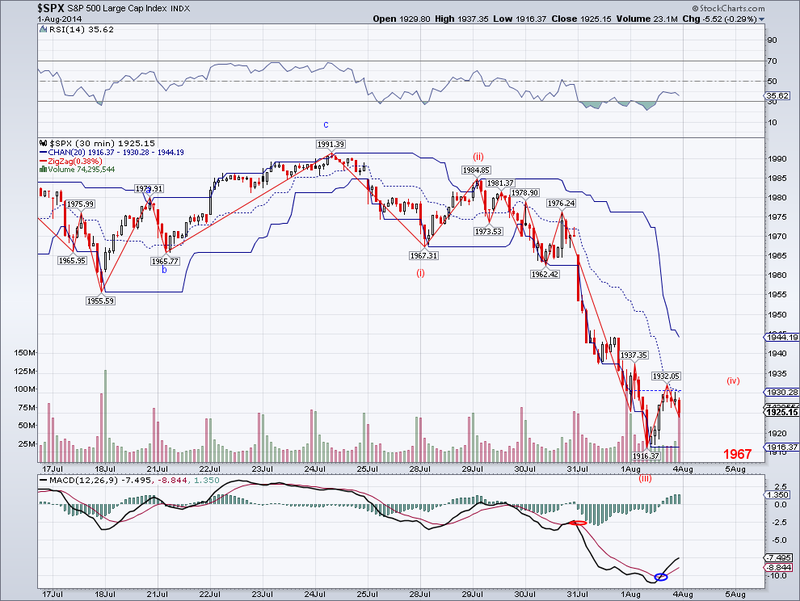 Still, we could see market top around the 50 DMA before another bigger bearish wave to the 200 DMA at 1864. 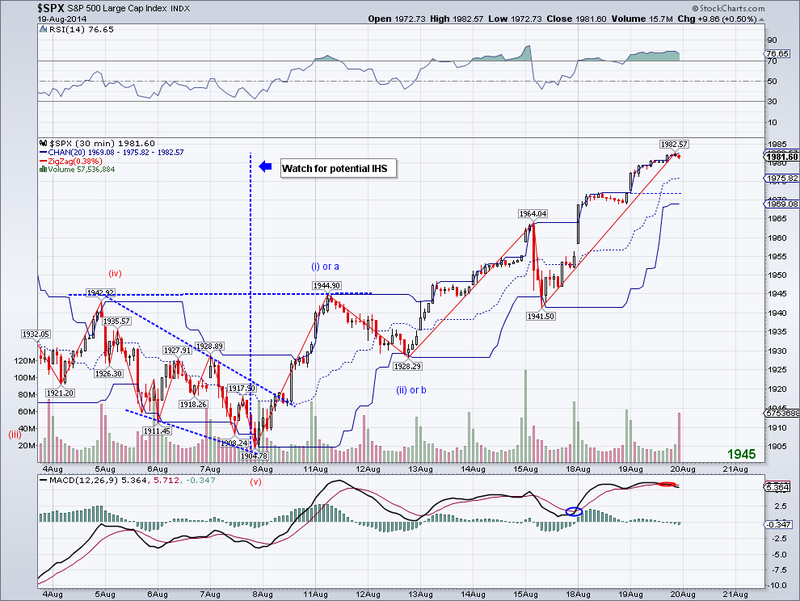 If the 50 DMA doesn't hold the advance then the market will very likely go for the IHS target of 1981. The counter rally continued today but topped around the 1942 resistance level. The wave to 1944 can be counted as an A wave or a Bullish W1, so now I am expecting a retrace to around 1916 and depending on the wave after the retrace, we'll find out if the correction will continue or we're in for SP2000's. 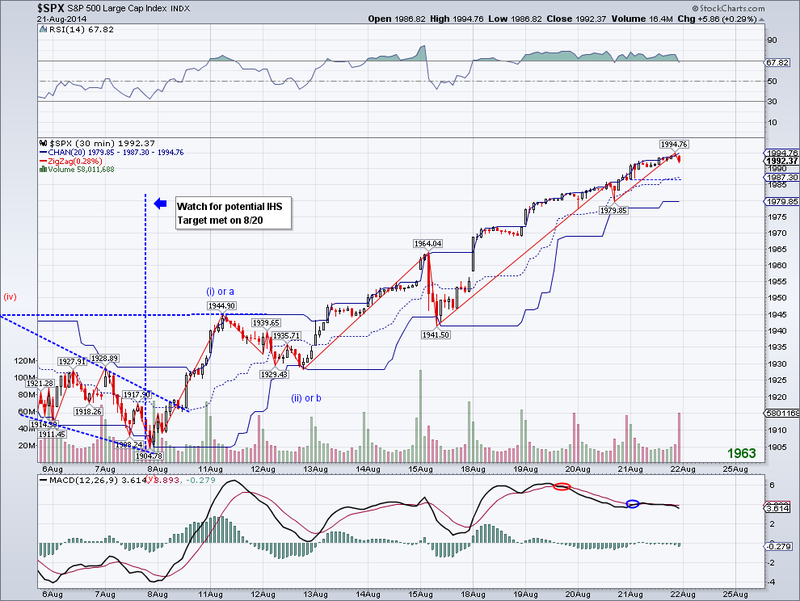 I don't see the market breaching its 100 DMA at 1915 on this coming bearish wave, so I might use that level to go long. But just in case, I bought back my Gold position. 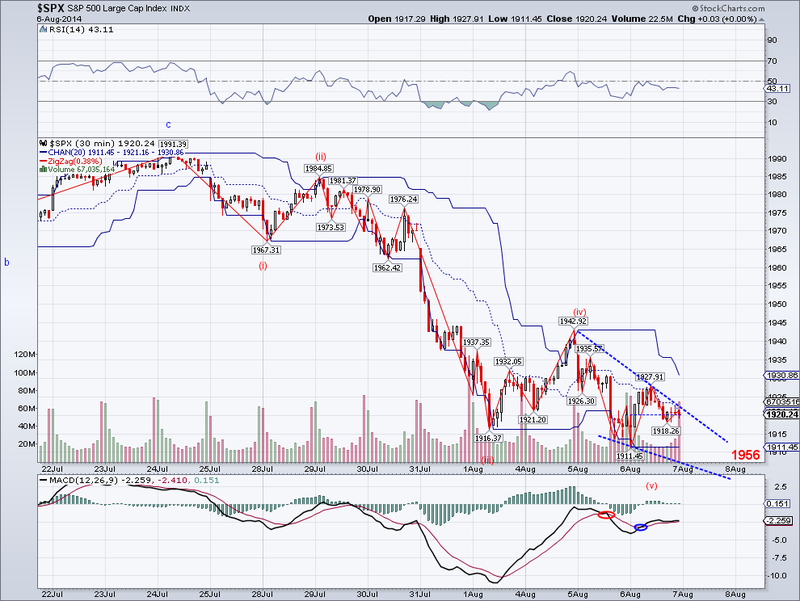 The market broke out of the wedge today in a strong counter rally. The market actually did make it to the 1885-900 target zone I was hoping for since last week, but unfortunately it was not reflected in the cash market as this happened in pre-market, and the rally was in full swing already early morning. Taking into account how much the market rallied from the pre-market low to EOD, the wave is 37 points. If this is part of an ABC move, the market should easily reach the 50 DMA. But if this is a bullish W1, we are looking at new time highs. The current longer term count is likely to be a W4, and as such corrections will not be as deep and it's a good idea to prepare for a sideways correction/shallow correction before the market resumes its bullish trend. One piece of "real" news (as opposed to "excuse" news), is the export numbers from China yesterday. The numbers were very strong, and that signals the world economy is doing well. So despite all these events in Russia, Iraq, Argentina, etc. The bigger picture is the World's GDP continues to grow and companies continue to grow profits, which lays the foundation for a continued bull market. I am on the sidelines with my trade account as I didn't get a chance to buy at the 1885-900 level. But if we get a decent B or W2 retrace, I'll be able to go long. 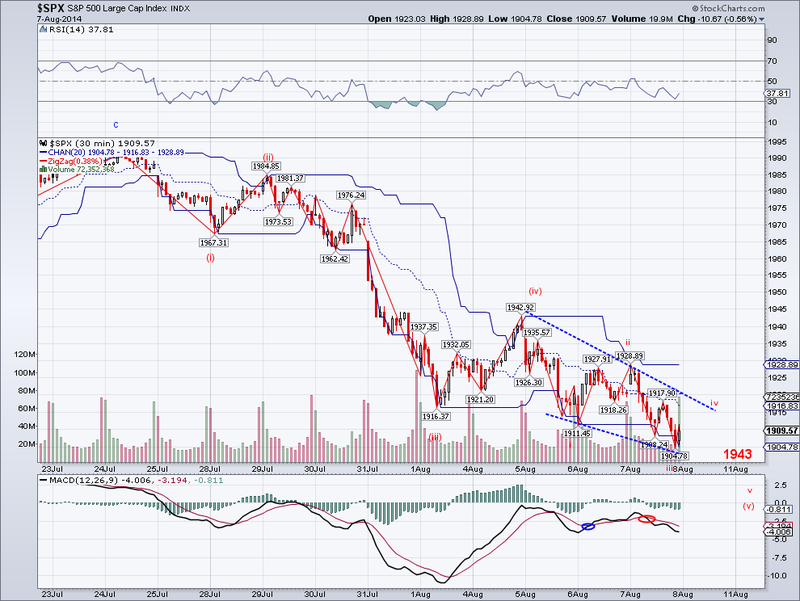 The market made lower lows a expected but I don't think it's done yet. The Falling Wedge pattern is in play and I only see 3 waves within it so far, so perhaps we'll see a small bounce in pre-market or tomorrow and then one more wave down to my target area. The low today was 1904 and we could see a counter rally start from here, but I am not buying it just yet. I did however sell my Gold position for marginal profit, but I will probably buy it again instead of shorting when the market rallies to the Trend Average. The market made another lower low today and bounced early morning. However, the counter rally was weak considering how short term oversold the market is. So I suspect there will be lower lows to come before the end of the week. The wave from 1942 to 1911 actually has 5 waves and could be the final 5th wave, but it is short of my "ideal" target, and I think a Falling Wedge might be in the works. Gold finally rallied today, which might be a signal that money is starting to flow to safe haven assets. But my plan remains the same, I will sell Gold if the SP500 makes it to the 1885-1900 range and long the SP500 to the Trend Average. The market made a lower low as expected and this bearish wave should be the final one in the structure before another counter rally. 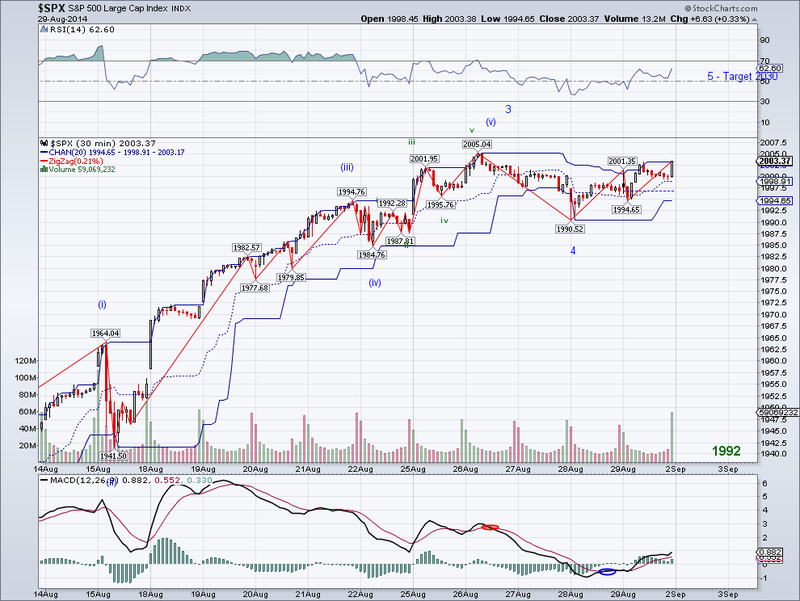 Looking at the micro count on today's bearish wave, I see an incomplete impulse. So there's a good chance the market is not done selling just yet. 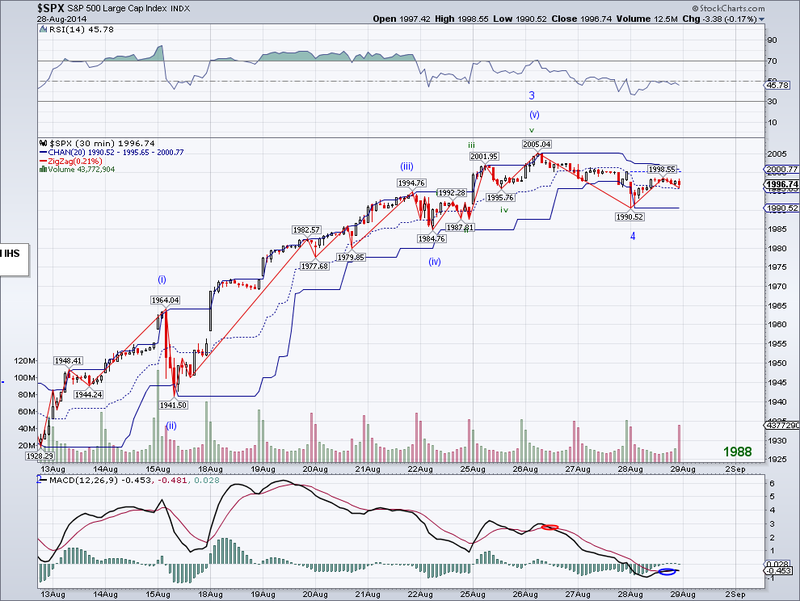 If 1942>1926 is wave 1, then I have 1885-900 area as the target for a bottom and the level I like for going long. I just hope Gold does something so I can cash in with some profit, despite the geo-political news that were supposedly the reason for today's sell off, Gold barely moved. Which implies there isn't as much fear during this sell off. Last but not least, the Medium Term Trend has turned bearish and this now has the potential to drag one for a few weeks or even months. If you enjoy shorting, the risk/rewards favors the bears as long as the market trades under the Trend Average and the 50 DMA. 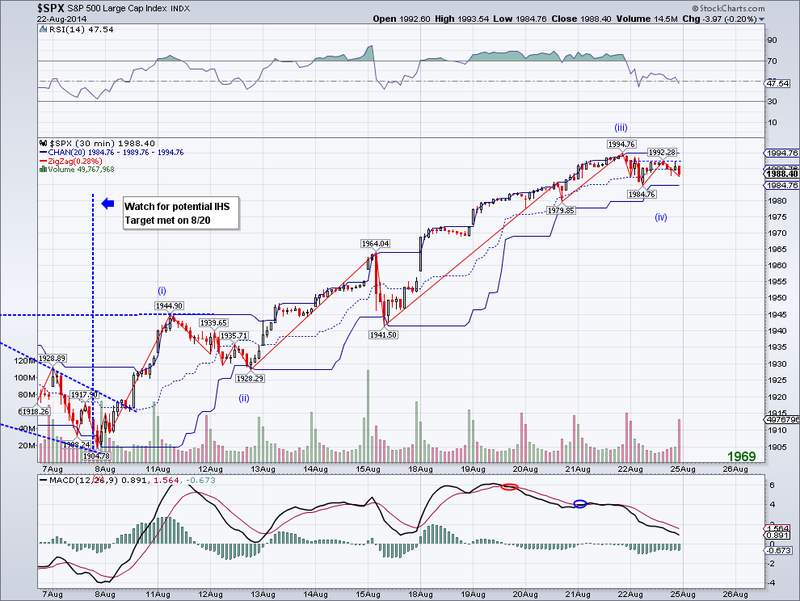 The market has continued to bounce and there's now an ABC from the 1916 low. A drop from this level to make a lower low would satisfy the 5 wave count, hopefully it will be in the 1885-900 area so I can go long! If the the bounce continues and is able to over the 50 DMA at 1954 and the Trend Average, then there's a chance for the bulls to regain control. But for now, this remains a counter rally within a bearish trend. Also, the Medium Trend change to the bearish side looks imminent at this point. 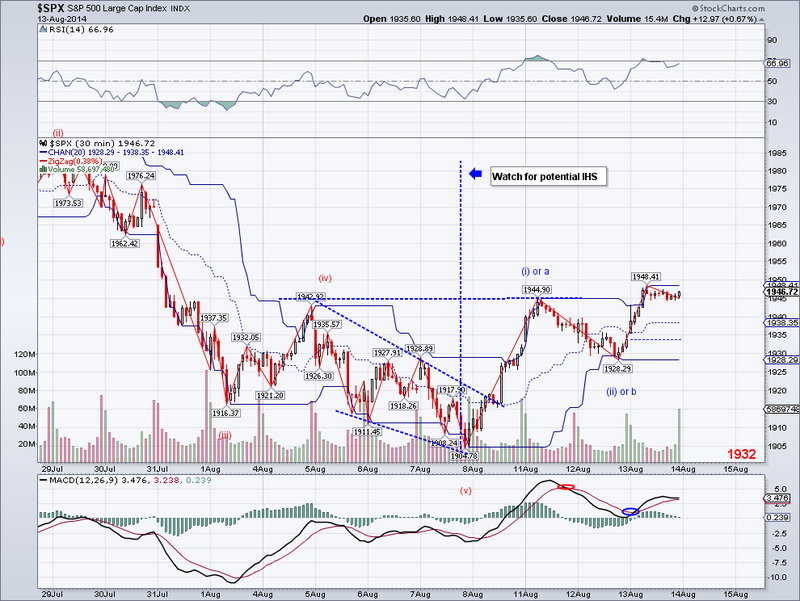 It would take a huge day up to keep the IT from turning bearish. The market continued it's sell off today and put in a low of 1916, which looks to me like the end of W3. 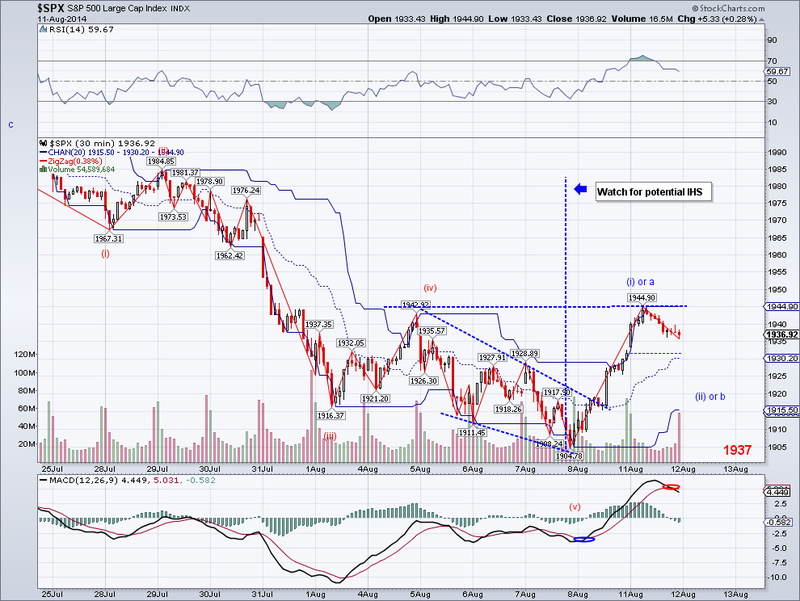 Ideally, we'll see a W4 bounce and get a lower low on a W5. The area I am watching is the 1885-1900 area, which has a cluster of support and which could provide a lower risk/higher reward long set up. If there's a sell off early Monday to that level, I will be selling my Gold and going long there with stops at the lowest support. This correction we are seeing could be the start of a Zig Zag or a Triangle to form a Primary 4 (or LT Int 4 as I sometimes call it) for the longer term count. There is the chance the whole structure from 1074 is complete, but I like the idea of a Primary 4 and then a rally to 2400 more or less. 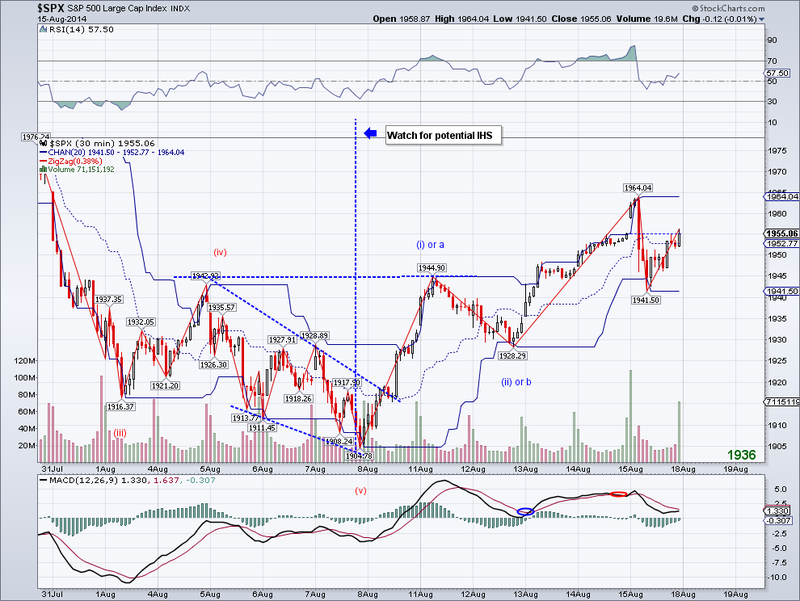 IF this is a P4, the ideal bottom will be 1737, so another 10% downside from today's close. Economies around the world are looking strong, specially the US and China, so maybe we'll have see another big rally later this year or next until we see the next serious recession. Which would coincide with the last year of the US Presidency, just as it happened to the last two Bush Presidents (Clinton missed it by one year). Should a recession come during Obama's last year, Jeb Bush will be the new President imo.